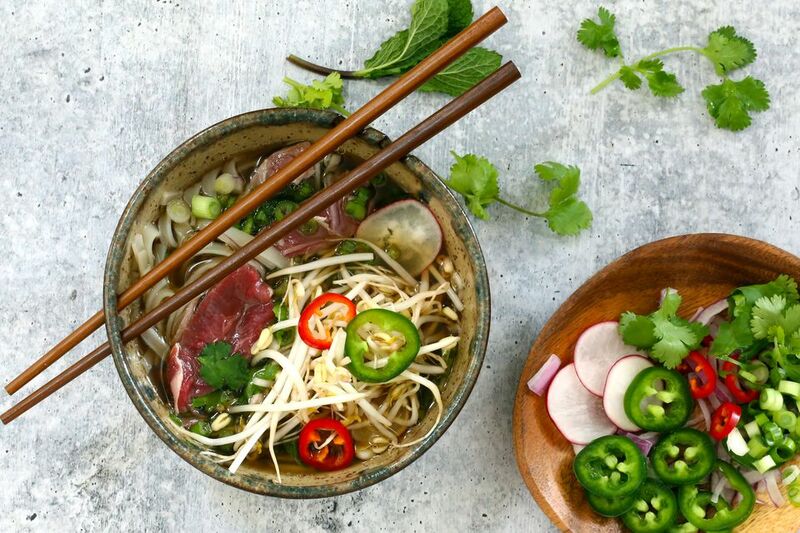 Pho is Vietnam's national dish and just one spoonful will tell you why. A wonderfully fragrant, subtly spiced broth is the secret to a delicious bowl of pho and an Instant Pot will help you become a true master of the noodle soup. The broth can take as long as six hours on the stovetop, but it takes requires 40 minutes in the Instant Pot. The cooking time is relatively short, but make sure you allow plenty of time—about an hour—for pressure to build up and release naturally. Any electric or stovetop pressure cooker may be used, but make sure to adapt as needed to follow the manufacturer's recommendations and safety precautions. Note: While there are multiple steps to this recipe, the broth and soup are broken down into workable categories to help you better plan for preparation and cooking. Place the beef shanks or soup bones and beef chuck in the Instant Pot and cover with water. Choose the highest sauté function and bring the beef to a full boil. Continue to boil for five minutes. Carefully drain the beef and discard the liquids. Rinse the meat and set aside. Boiling and rinsing the beef ensures the final broth will be clear instead of cloudy. Choose the normal sauté function and add the star anise, cinnamon stick, coriander seeds, and whole cloves. Cook, stirring frequently to prevent burning, for about five minutes, or until the spices are toasted and aromatic. Alternatively, toast the spices on the stovetop over medium heat, then add them to the Instant Pot. Peel the onion and cut it in half lengthwise. Slice the halves thickly. Peel the ginger and cut it into small chunks. Add the onion slices and ginger to the pot along with two teaspoons of cooking oil and cook on the normal sauté setting until lightly charred, stirring frequently. Cancel the sauté function. Add the rinsed beef and bones back to the pot along with eight cups of water. The level should be just under the max fill line of a six-quart pot. Add the sugar (if using), 1 1/2 teaspoons of kosher salt, and the pepper. Lock the lid in place and turn the steam release valve to "sealing." Select the manual setting, high pressure, and set the time to 40 minutes. When the time is up, let the pressure come down naturally for 20 to 25 minutes. Carefully turn the steam release valve to "venting" to release any remaining pressure. Using a slotted spoon, remove the meat, place in a bowl and set aside. Strain the liquids into a large bowl or pot through a fine mesh strainer, and discard the solids left in the strainer. Shred the beef and add it to the broth. Add one tablespoon each of fish sauce and soy sauce, then taste and adjust seasonings as needed. At this point, you may refrigerate the broth until you are ready to assemble and serve the soup. Bring the meaty broth to a simmer in a saucepan or in the Instant Pot. Cook or soak the rice noodles or rice sticks following the package directions; drain well. Slice the raw beef very thinly across the grain. Add hot noodles to each bowl, followed by several strips of raw beef. Spoon some of the red and green onions over the beef, then ladle hot broth over all. Finish with 1/2 to 3/4 cup of bean sprouts, cilantro, sliced chili pepper, and other garnishes, as desired. If you would like to cut back on the fat content, refrigerate the broth until the fat solidifies. The fat provides richness and flavor, so leave at least a few tablespoons. If you aren't sure you'll like the flavor of fish sauce, add it in small amounts along with the soy sauce, tasting as you go. The hot broth will cook the thinly sliced beef, but if you prefer well-done meat, broil or pan grill the steak before slicing, or briefly stir-fry the slices.